CIRCLE OF HONOR: The 1955 Rainbows football team, former UH offensive lineman Joe Onosai and the late statistician and benefactor Toshio "Bob" Nagatani will officially be inducted as the 25th UH Circle of Honor class tonight at the Stan Sheriff Center. 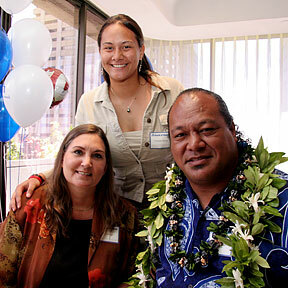 Onosai brought wife Ann, left, and daughter Careena to the honors luncheon yesterday. The recent big-screen release of "Factory Girl" focuses attention on 1960s "anything goes" mod era.